Simply touching a prayer wheel brings great purification of negative karma. Turning a prayer wheel containing 100 million OM MANI PADME HUM mantras accumulates the same merit as reciting that many mantras. Anyone with a disease such as AIDS or cancer can use the prayer wheel for healing. For example, sick people could come to centers with prayer wheels for several hours every day to turn the wheel and do [healing] visualizations. 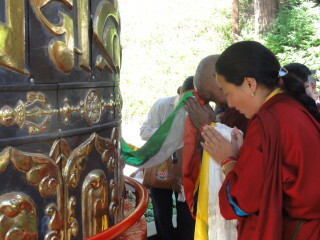 Lama Zopa Rinpoche with prayer wheel. 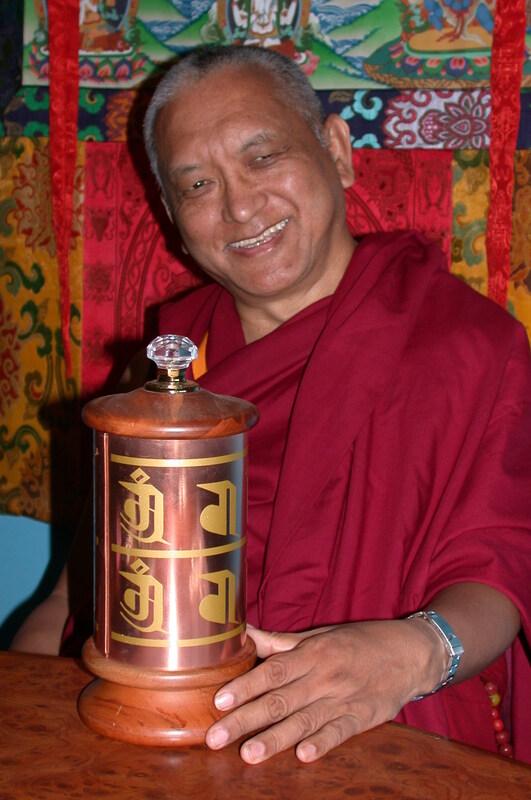 Lama Zopa Rinpoche established the Prayer Wheel Fund in 1994. The aim of the fund is to provide the resources needed for the creation of 100,000 prayer wheels around the world (minimum height of 6 feet), with some wheels placed in the ocean. This is one of Lama Zopa Rinpoche’s vast visions for FPMT. Please read more about Rinpoche’s ’s vast vision for 100,000 prayer wheels and see the amazing prayer wheels that are being built around the world. Lama Zopa Rinpoche has commented that simply the presence of a prayer wheel creates peace and harmony in the area. A prayer wheel is a cylindrical wheel on a spindle made from metal, wood, stone, leather, or even coarse cotton. Prayer wheels range in size from mere inches to many feet. They all contain the mantra of the Buddha of Compassion, om mani padme hum, printed many millions or billions of times on paper or microfilm. Lama Zopa Rinpoche at the smallest prayer wheel at Land of Medicine Buddha, USA. The origin of prayer wheels is lost in time. According to legend, the Buddha Dipamkara gave the practice to beings called nagas. The great Indian pandit Nagarjuna was then instructed by Chenrezig to go to the naga realm and bring a prayer wheel into the world of humans. For centuries, the practice of prayer wheels has been among the most cherished by Tibetan Buddhists and it continues today. Whether being turned by Tibetans at sacred sites, tourists in Nepal, or by children in Western Dharma centers, the prayer wheel continues to transform minds and offer its blessing of compassion. Please read, “Notable FPMT Holy Objects Around the World,” from Mandala magazine April-June 2010. If you have a prayer wheel in your house, your house is the same as the Potala, the pure land of the Compassion Buddha. If you have a prayer wheel next to you when you die, you don’t need po-wa. Having the prayer wheel itself becomes a method to transfer your consciousness to a pure land. Simply thinking of a prayer wheel helps a dying person to shoot the consciousness up the central channel and out through the crown to reincarnate in the pure land of Amitabha or the Compassion Buddha. Simply touching a prayer wheel brings great purification of negative karmas and obscurations. Turning a prayer wheel containing 100 million om mani padme hum mantras accumulates the same merit as having recited 100 million om mani padme hums. 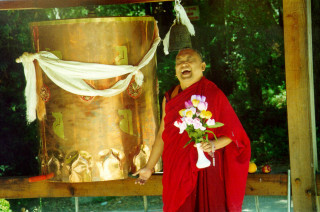 Lama Zopa Rinpoche and Khadro-la consecrating the biggest prayer wheel at Land of Medicine Buddha, California, in 2012. 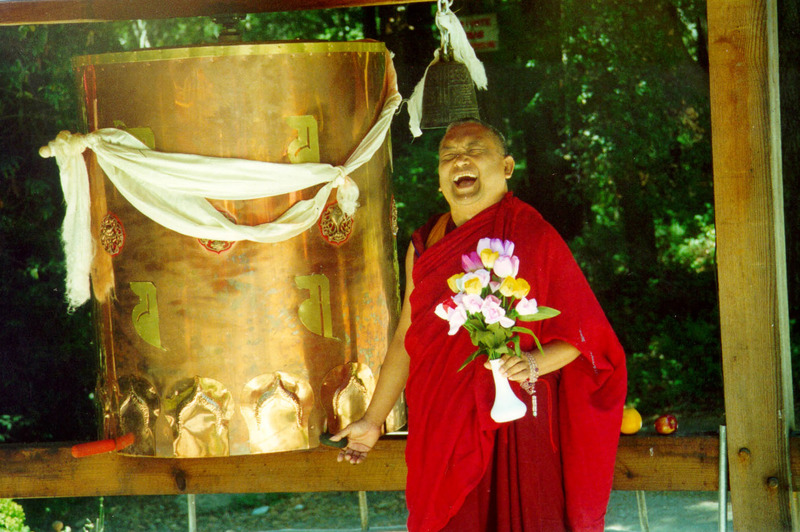 One of Lama Zopa Rinpoche’s heart projects is the building of prayer wheels and other holy objects around the world. Rinpoche has already inspired the construction of many large prayer wheels including those at Kopan Monastery and Lawudo Gompa in Nepal, Chenrezig Institute in Australia, three prayer wheels at Land of Medicine Buddha in the USA, Root Institute in India, and Osel Ling in Spain. The inconceivable merit of building a prayer wheel is not limited to the person who physically builds it; those who support the project financially, materially, or through prayer receive equal benefit! Help us make Rinpoche’s vision for universal compassion a reality! Or simply send your check in US dollars payable to FPMT Inc. and write “Prayer Wheel Fund” on the memo line. The Prayer Wheel Fund is a project of FPMT Inc. and is administered by FPMT International Office located in Portland, Oregon, United States. All donations made to this fund are tax-deductible within the United States in accordance with IRS Code article 501(c)(3) to the extent allowed by law. You don’t need to obsess over the attainment of future realizations. As long as you act in the present with as much understanding as you possibly can, you’ll realize everlasting peace in no time at all.